Students identify and define the steps of the writing process: prewriting, drafting, revising, editing, and publishing. Then they work through each step of the process as they respond to a prompt and write an expository essay. They evaluate how the steps of the writing process make their writing clearer, more organized, and more engaging. Students will self-evaluate based on a rubric. In this experience, students identify and define the steps of the writing process: prewriting, drafting, revising, editing, and publishing. Then they work through each step of the process as they respond to a prompt and write an expository essay. Finally, they evaluate how the steps of the writing process make their writing clearer, more organized, and more engaging. Identify and explain the steps in the writing process. Analyze how the writing process helps an author compose a well-written text. 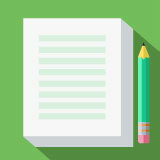 Compose an expository essay while using the steps of the writing process. Two to three class periods. The writing process is the steps an author follows to create a well-written piece of writing. In this experience, you will learn the steps of the writing process while writing an essay explaining your views on friendship. You may have heard the word process used, for example, the scientific process, the decision-making process, a biological process, or the manufacturing process. Try to define the word process based on these and any other examples that you know. Discuss student responses. When everyone is ready to continue, unlock the next part, which defines process for students. A process is the steps you take to get something done. If you play a sport, you probably learned a process to help you complete a skill, like making a free throw, hitting a ball, or diving. Learning and following processes help increase your chances for success. Writing is just like sports—the process can help you be successful.